PR pros describe atmosphere in Orlando; Pulse attack's impact on the presidential race; France deals with terrorism on its own soil; MSLGroup acquires Chinese cause marketing shop; Microsoft's deal for LinkedIn puts pressure on Google. 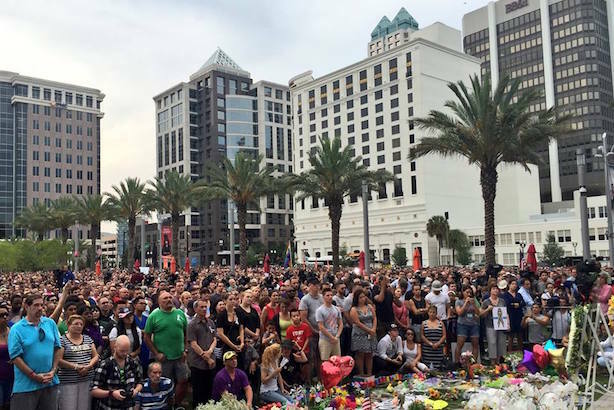 Thousands of Orlando residents gathered for a vigil on Monday night. (Image via the Orlando Police Department's Facebook page). In Orlando, scores of people showed solidarity with the victims of the Pulse night club massacre at the city’s first official vigil on Monday night. PR pros in the city described an atmosphere of neighbor helping neighbor in the hours after the mass shooting. President Barack Obama is scheduled to visit the city on Thursday to pay his respects to victims. The attack has shaken up the presidential race, with Hillary Clinton and Donald Trump responding very differently to the event. The results of an NBC News poll released this morning showed Clinton widening her lead over Trump and cutting into his advantages with men and white voters. (The poll was conducted from June 6 through Sunday). Trump banned The Washington Post from covering his events after what he called "phony and dishonest" reporting. Meanwhile, Clinton is set to meet with Bernie Sanders today as Washington, D.C., Democrats vote. France is dealing with a terrorist attack of its own on Tuesday morning as the country hosts the Euro 2016 tournament. President Francois Hollande called the killing of a police commander and his companion in a Paris suburb "incontestably a terrorist attack." The Associated Press has reported that the attacker shot video of the hostage event and posted it to Facebook Live before his account was suspended. MSLGroup has acquired Beijing-based cause marketing shop Have Faith in Your Brand and named its founder, Faith Brewitt, as CEO for Greater China. Her clients include the Bill & Melinda Gates Foundation, the Starfish Project, and the APEC China Business Council. The pressure is on Google to make a move of its own to respond to Microsoft’s acquisition of LinkedIn on Monday morning, which gives the Redmond, Washington-based company access to a vast pool of professional and personal data. Google could respond by bidding for Slack, Box, or Dropbox, according to Recode’s Mark Bergen and Arik Hesseldahl. What to know on Tuesday morning: Snapchat’s advertising play could be a sign of an IPO; Gawker Media gets a $22 million bankruptcy loan; Fanduel, DraftKings in merger talks as both face regulatory crackdown. Apple still lags in artificial intelligence race despite Siri enhancements.